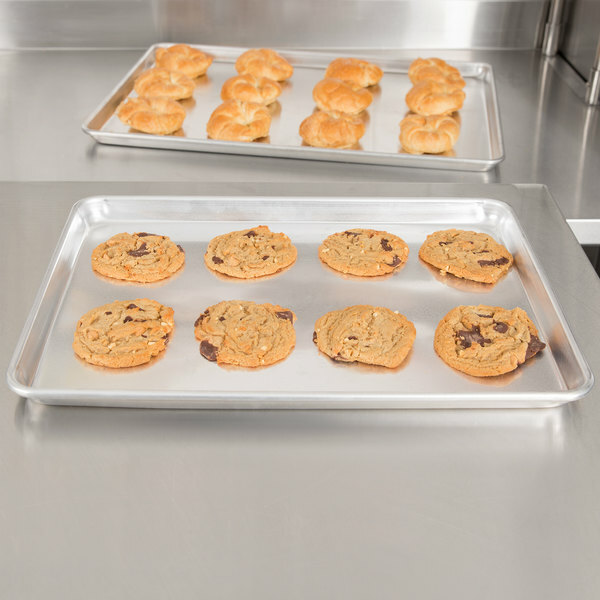 Vollrath 9303 Wear-Ever 1/2 Size Aluminum Bun / Sheet Pan 19 Gauge - Wire in Rim, 18" x 13"
Use a Vollrath 9303 Wear-Ever 1/2 size aluminum sheet pan to bake delicious cookies, rolls, and croissants at your business. 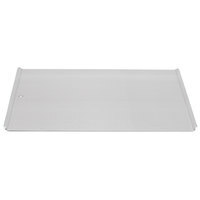 A Vollrath 9303 Wear-Ever 1/2 size aluminum sheet pan is perfect for a wide variety of tasks in your commercial kitchen. Use it to bake desserts in your bakery or to cook and reheat foods in your restaurant. Thanks to its upturned lips, this pan prevents products from sliding off, and it’s easy to hold when transporting food from the oven to a cooling rack. 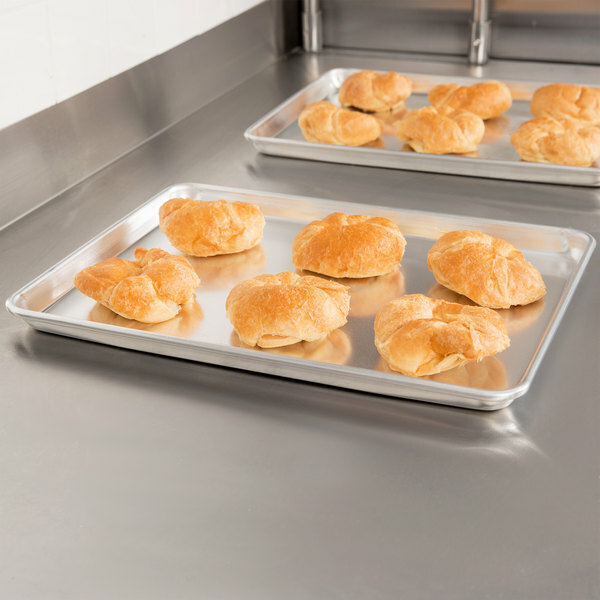 "Vollrath's sheet pans are great! They are built to last a long time and do not bend easily. I only buy Vollrath sheet pans for my kitchens." 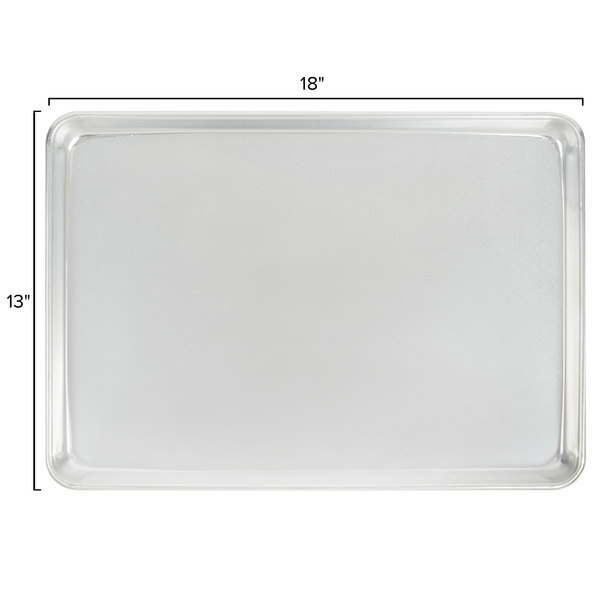 This 1/2 size sheet pan measures 18” x 13” and is perfect for baking larger portions of food. 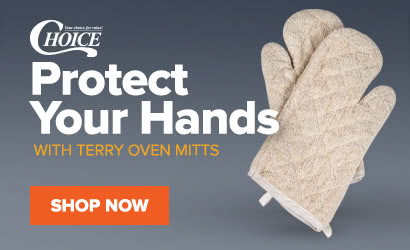 Use it to toast garlic bread, bake batches of cookies, or reheat chicken tenders and other foods. Plus, since this pan is smaller than its full-size counterpart, it will easily fit in the fridge. 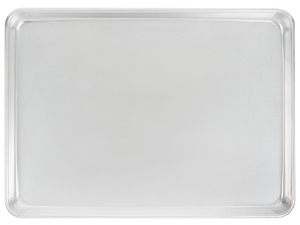 Made from 19 gauge, 3004 impact-resistant aluminum, you can count on this pan to last in your commercial kitchen. A galvanized non-rusting rod in its beaded rim also helps the pan retain its shape through repeated use. 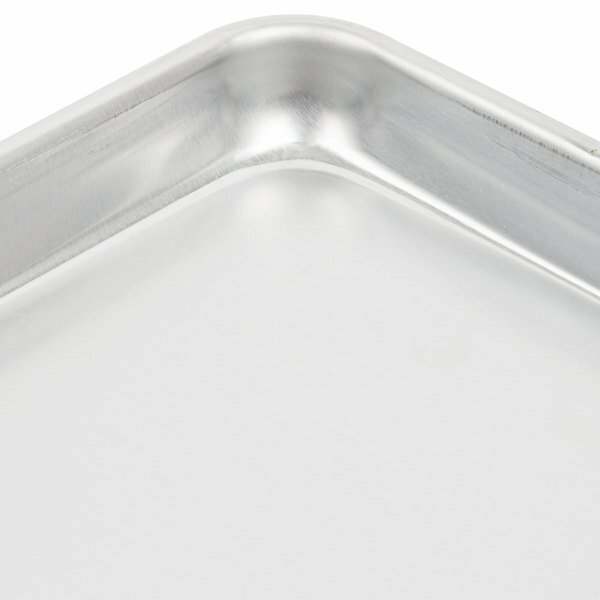 Thanks to this Vollrath sheet pan’s aluminum construction, it heats up and cools down quickly. 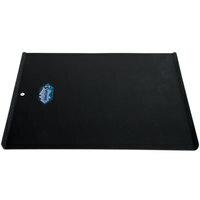 Its concave bottom flattens during heating for even heat distribution and consistent baking. 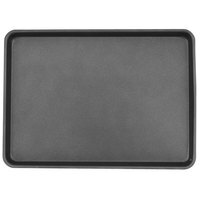 What is the best/easiest way to remove carbon buildup from sheet pans? 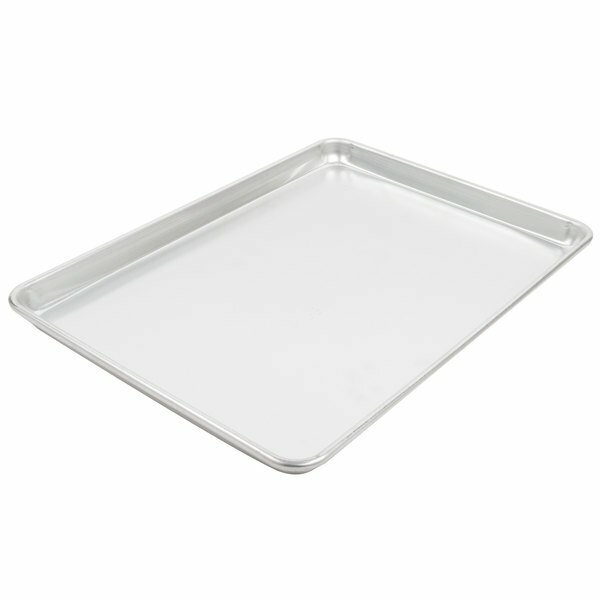 Item #: 9369303 Vollrath 9303 Wear-Ever 1/2 Size Aluminum Bun / Sheet Pan 19 Gauge - Wire in Rim, 18" x 13"
Item #: 9365303 Vollrath 5303 Wear-Ever Heavy Duty Half Size Aluminum Bun / Sheet Pan 18 Gauge - Wire in Rim, 13" x 18"
Item #: 9365314 Vollrath 5314 Wear-Ever Heavy Duty Half Size 13 Gauge Aluminum Bun / Sheet Pan - Sanitary Open Bead Rim, 13" x 18"
Item #: 9365303P Vollrath 5303P Wear-Ever Perforated Half Size Aluminum Bun / Sheet Pan 18 Gauge - Wire in Rim, 13" x 18"
Item #: 9225303NS Vollrath 5303NS Wear-Ever 1/2 Size Non-Stick Aluminum Bun / Sheet Pan WearGuard 18 Gauge - Wire in Rim, 18" x 13"
Vollrath 5314 Wear-Ever Heavy Duty Half Size 13 Gauge Aluminum Bun / Sheet Pan - Sanitary Open Bead Rim, 13" x 18"
Vollrath 5303NS Wear-Ever 1/2 Size Non-Stick Aluminum Bun / Sheet Pan WearGuard 18 Gauge - Wire in Rim, 18" x 13"
Vollrath 5303P Wear-Ever Perforated Half Size Aluminum Bun / Sheet Pan 18 Gauge - Wire in Rim, 13" x 18"
Vollrath 5303 Wear-Ever Heavy Duty Half Size Aluminum Bun / Sheet Pan 18 Gauge - Wire in Rim, 13" x 18"
Overall User Rating: Vollrath 9303 Wear-Ever 1/2 Size Aluminum Bun / Sheet Pan 19 Gauge - Wire in Rim, 18" x 13"
I bought these pans because they were recommended by others and I have not been disappointed. They are strong and do not bend under weight or high temp. Clean-up is easy. I recommend these if someone is looking for rimmed sheet pans. 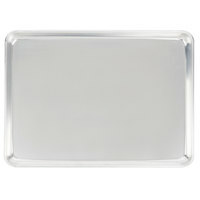 This sheet pan is excellent quality for the price. It doesn't warp in the oven and when coupled with the wire rack which fits it perfectly, it's indispensable in the kitchen. I highly recommend this item. I was looking for heavy duty sheet pans for baking. 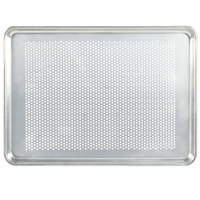 I making French Macrans often and need a heavy duty baking sheets that baking evenly. These sheet pan worked great. An essential for every baker. I have a few dozens of these on my speed rack that I use for baking, cooling, holding ingredients, and decorating. The lip keeps everything in. Thick, sturdy, good quality, doesn't warp. Easy to clean, dry, and store. Love this brand. Great quality pans at a good price. Food turned out great and they seem like they will last a very long time. This pan arrived with a few dents and within 20 minutes of sending an email to customer service, they had a new pan shipped to me at no cost! Great customer service! really nice. comes in really shiny. haven't had any problems with biscuits sticking or burn marks on these. definitely heavier duty than most sheet pans. These half-sheet pans are fantastic for cookies and roasted veggies alike! Unlike some sheet pans, they are light enough to get in and out of the oven with ease even if they are loaded down with something. They stack beautifully for simple storage and wash easily by hand. 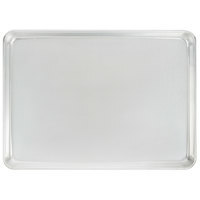 I ordered this Vollrath sheet pan six months ago. In those six months, it has gotten constant use. In the past, sheet pans have discolored and warped. This one is in the same condition as the day I bought it! 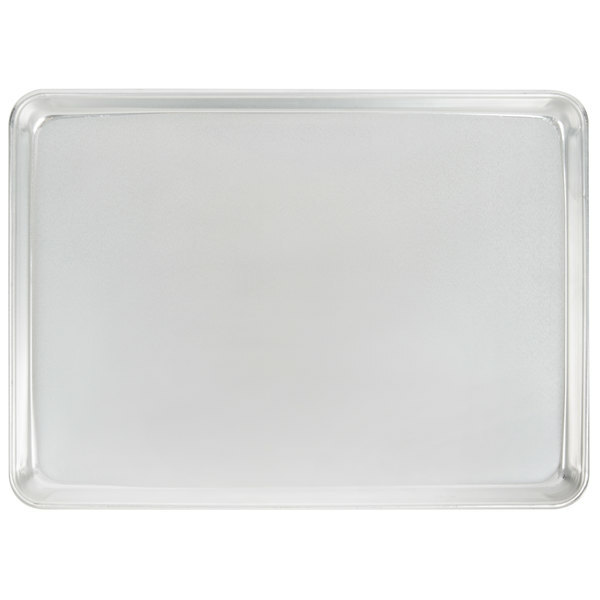 I am very happy with the quality and price of the vollrath baking pan's there perfect for so many applications in the kitchen and wear very well really nice product. This has worked great for making this chilled almond bar that I make. It keeps the form of the cookie and stays cool while in the fridge. 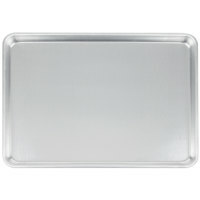 Not knowing the difference when it comes to sheet pans/cookie sheets. I found out the cheap ones in department stores are just terrible. They plump up when in the oven and your pies and cookies comes out crooked. Not a very good site to see after baking.So I went onto WEB.COM and a customer service person at WEB.COM helped me, and what I found out was truly amazing. The higher the gauge the better the sheet pans. Like I knew that. No I did not. But I purchased this half size 19 gauge and my pies and cookies all come out even. No bumps in the sides and the cookies came out evenly also. The price you cannot beat it.And cleaning time is quite fast.And storing them sideways is a huge help when you are limited on space. Buy several you will use them all through the year. Vollrath's sheet pans are great! They are built to last a long time and do not bend easily. I only buy Vollrath sheet pans for my kitchens. I like these sheet pans. I use them at home, I am not a professional. I did post a review on the slightly cheaper brand sold here that those cheaper ones are just as good so if you are looking to save a couple bucks you might want to go with those instead of these. 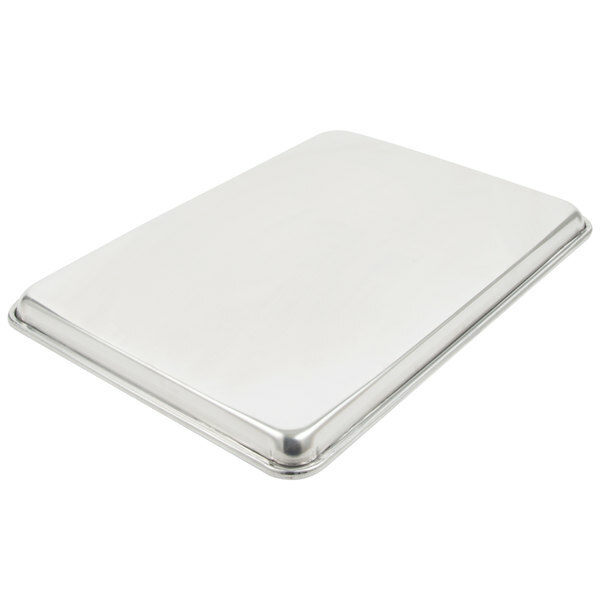 But these Vollrath pans are still better and cheaper than what you find in stores. First, the label sticker was on the baking surface of the pan and did not come off easily at all. Second, it was slightly warped and dented when I got it. It is fine for using on making caramel corn or roasting nuts with parchment, but I would never bake a cake or anything like that in this. have several of these durable pans. I use them for baking rolls and candy-making. The parchment sheets fit nicely in them, which makes for an easier clean-up. This is the perfect baking sheet. My Christmas cookies turned out great and I am giving our five grown children two of them as part of their Christmas gifts. These pan will last a life time and the price is right even including the shipping costs for the 12 pack.